Garlicoin is the hottest new meme cryptocurrency. 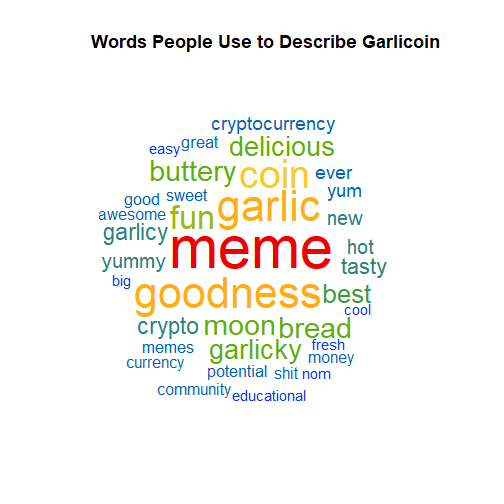 Created by /u/DigitalOrange of the /r/garlicoin community, it is a digital currency that users can buy, sell, and "mine", and it is officially the "Garlic Bread" cryptocurrency, originating from the /r/GarlicBreadMemes subreddit, a subreddit dedicated to garlic bread memes. See garlicoin.io if you are interested in learning more about it. Mining involves receiving undeciphered codes from a group of independent servers and then using your computer to crack the code and send it back to those servers to prove that you solved it, at which point they will reward you with this currency. For a while, it was extremely profitable to mine this currency, as you could easily make $0.50 - $1.00 per hour worth of Garlicoin with a single computer. 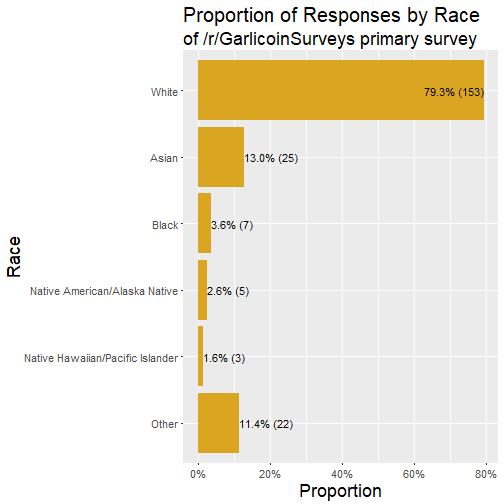 At that time, I created a community on Reddit, /r/GarlicoinSurveys, to allow users to offer Garlicoin as compensation for completing surveys. This is a low-risk way for users to collect data and offer guaranteed compensation with very little overhead. 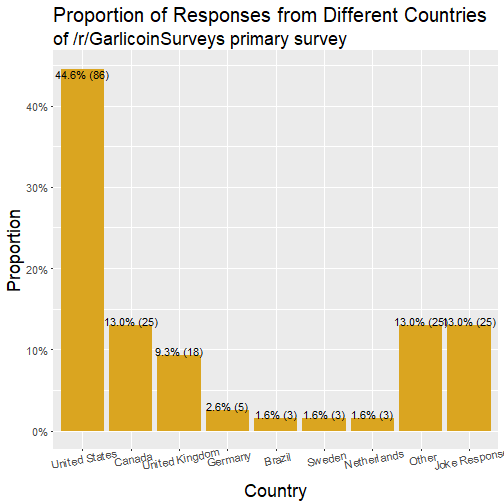 I created a survey with 193 responses from the Garlicoin community, asking various questions about cryptocurrencies and Garlicoin. Unfortunately, I waited too long to make this post, so a lot of those questions are outdated now. 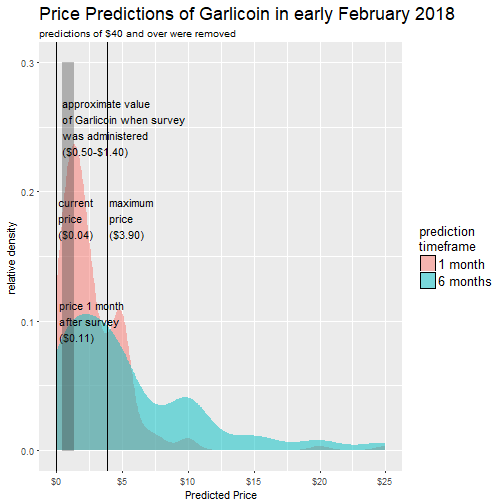 However, I do have some insights regarding the community, especially given the predictions of Garlicoin's price. I will be distributing up to 200 GRLC (symbol for Garlicoin) by May 5th to referral links to pages on my website that include /?garlicoin_ref=[your_garlicoin_address_here] in the URL as a query parameter. 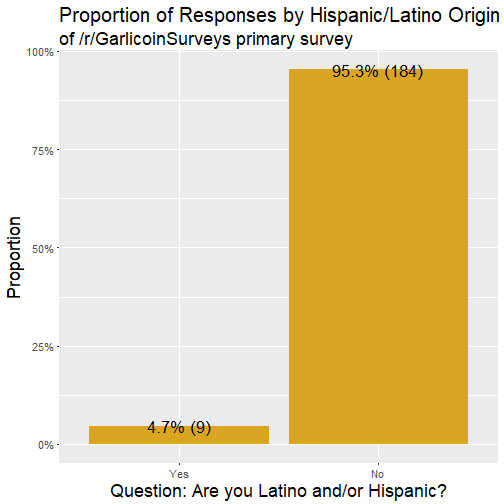 For example, my address for survey payouts is GYyHGTtedQefQvuuRpbBM2zQQrNwkuUbdK, so I would link this article with https://maxcandocia.com/article/2018/Apr/09/garlicoin-community/?garlicoin_ref=GYyHGTtedQefQvuuRpbBM2zQQrNwkuUbdK. I will add 1 GRLC per 100 unique visits, up to 200 GRLC at 20,000 unique visits, and then distribute it evenly among all unique visits after that point. Please no spamming of my links to other websites, or spamming of fraudulent visits to mine. I will invalidate any fraudulent visits. I will include all referrals up until the end of this month, and the referral codes may be good for future promotions I make with this concept. I make no guarantees beyond this month of April, 2018, though. 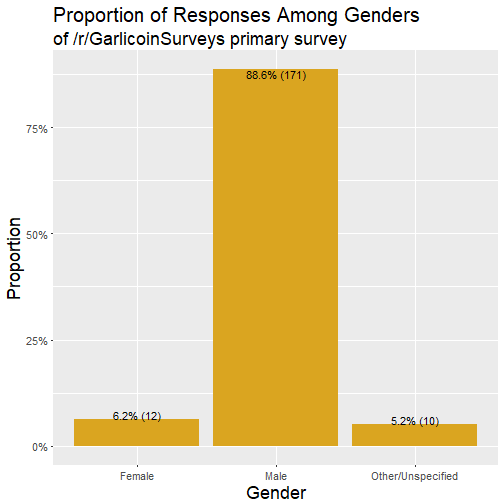 At the time of the survey, it was profitable to mine Garlicoin with your CPU. This is pretty much impossible to do for any major cryptocurrency, but it definitely allowed people to get involved without having to buy an expensive GPU. 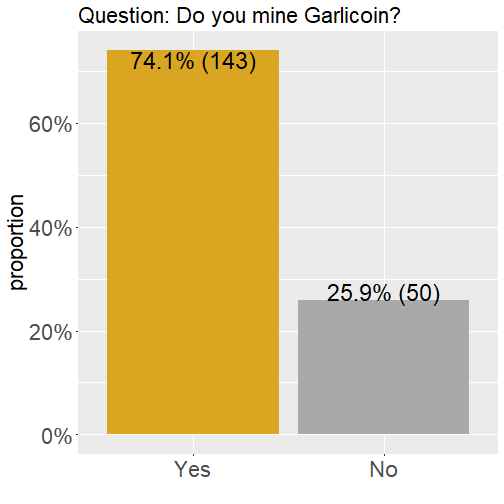 About three quarters of the respondents mined Garlicoin at the time. As far as other cryptocurrencies were concerned, Bitcoin, Ethereum, and Litecoin were the most popular. 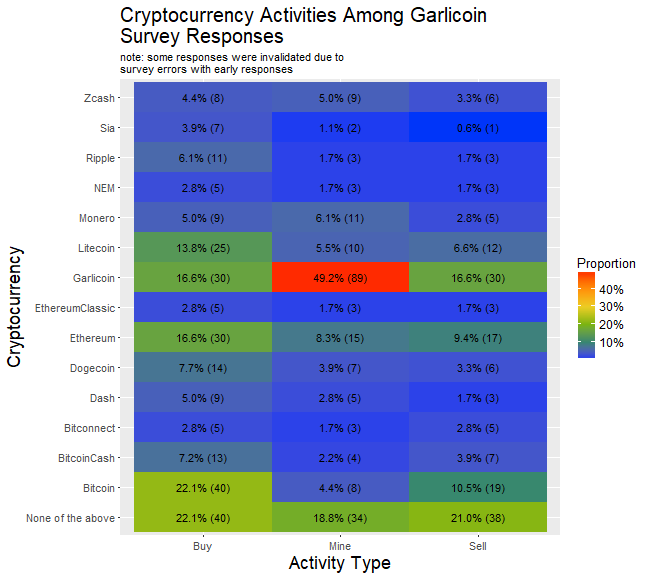 Garlicoin, however, was by far the only one most people mined, although many people bought other currencies and sold them about half as frequently. 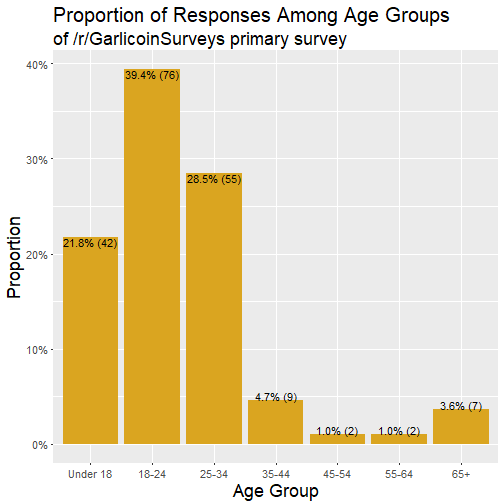 Oddly, the number of responses for Garlicoin mining are 33% lower (from 75% to 50%) lower for this question. A small bit may be explained with some of the error introduced by a validation oversight for the first 17 responses, but I am guessing the question itself may have been too information-dense for the attention spans of some of the survey-takers. 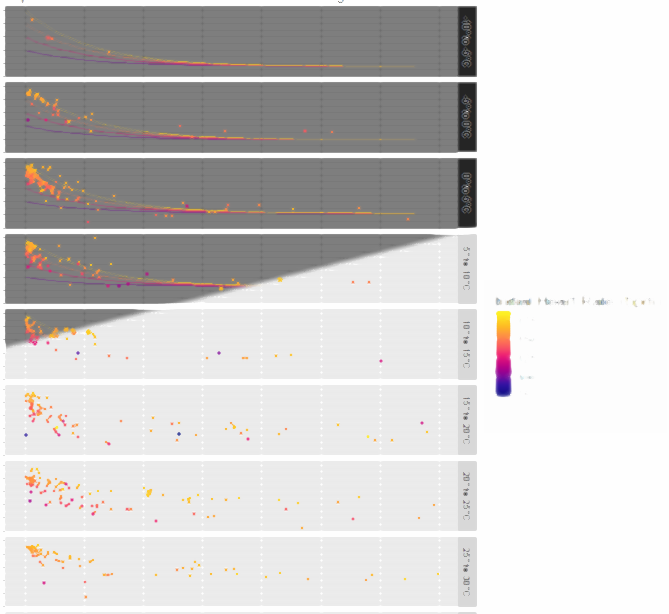 One tool I like to visualize groups in a community is hierarchical clustering. I looked at the common buying/selling/mining behavior among each user across each of the listed cryptocurrencies, and I looked to see which cryptocurrencies were grouped together most often, weighting similar activities more strongly than different activities. Unsurprisingly, the three major coins, Bitcoin, Ethereum, and Litecoin, were all grouped together. 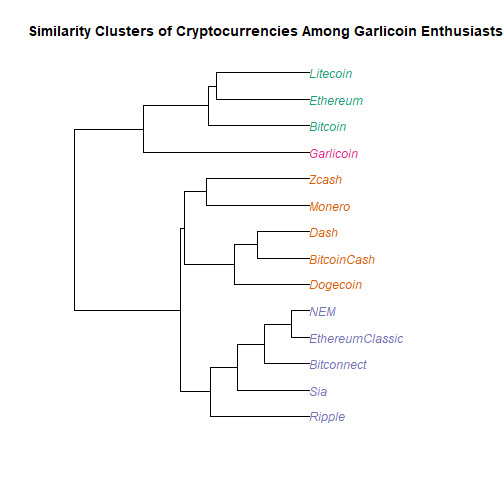 Garlicoin is likely closest to them simply due to them being the most common in the sample, but you can see that people who use Zcash are more likely to use Monero and vice-versa, and the same goes for the other branches. At its peak, Garlicoin was around $4.00. It stayed around $0.50-$0.60 for a while, until it steadily declined. Right now it's about $0.04. At the time of the survey, the price was very volatile, ranging from $0.50 to $1.40, roughly. People were vastly overestimating how much it was worth at the time, and some lost thousands of dollars buying it at higher prices. I asked respondents what they thought the price would be in 1 month (March 2018) and 6 months (August 2018). The medians of those values were $2.00 and $4.20, respectively, after removing some very unrealistic outliers. In early March, its value decreased to around $0.11, and I am guessing its value won't be anywhere above that value for quite a while. I used coinmarketcap.com to retrieve historic values of the cryptocurrency. The area in dark gray is the approximate value at the time of the survey. Almost everyone overestimated its worth a month from that time, and I can only imagine that the 6-month figure will be even more different from the corresponding predictions. One possible and likely reason for the early spikes in prices were "Pump and Dump" schemes, where a group will start buying a lot of a commodity/asset, driving its price up, and then rely on the momentum of those outside the group buying in response, sometimes attributed to the fear of missing out. Then, when the price is sufficiently high, the initial buyers will "dump" (sell) all of the commodity/asset, making a huge profit, and then others will realize that no one is buying at higher prices, and the price will crash back down. This is illegal to do in many areas of finance, although there are no formal rules for cryptocurrencies regarding "pump and dump". Respondents also provided Demographics. The general takeaway is that the vast majority of the community is male, white, non-Hispanic, and from the United States, Canada, or the UK. Most of the users are no older than 34. 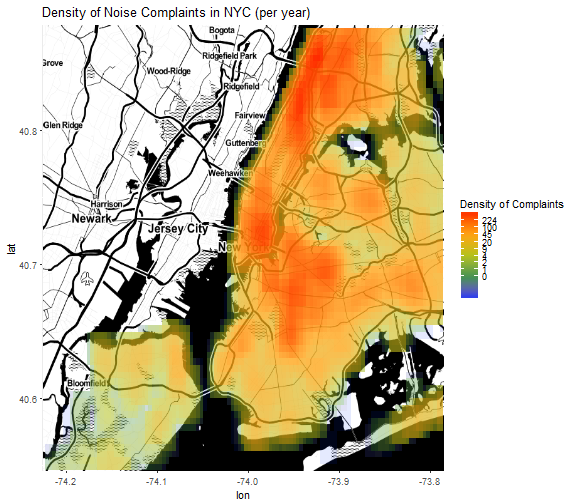 In this example, I use noise complaint data from New York City to demonstrate how you can plot densities of events on a map, as well as how extreme the averages are.